Redang, a tropical island paradise that offers some of the best beaches, snorkelling and diving in peninsular Malaysia. Use this online guide to plan your trip and more importantly, to learn to care for its marine environment. Check sea and weather conditions before going. Any rough sea warnings for Terengganu will apply to Redang. Today is the 6th day since Malaysian Airlines flight MH370 disappeared enroute from KL to Beijing. It's a mystery of global proportions that has received coverage by every major news media organization round the world and got all kinds of experts commenting on the incident. It's a greater mystery that so much reporting and comments can be made based on so little real information. It's like writing a 3-part novel based only upon knowledge of the novel's title. Having followed every breaking news on this incident closely, my heart and prayers go out to the families and friends of loved ones on that flight who must feel like they're on a never-ending roller coaster of hopes and disappointments. Not surprisingly, emotions are running high. It is frustrating not just for families and friends waiting for news, but equally so for those involved in the search and rescue mission. It is good to see many of the countries involved putting aside their differences and united in purpose on humanitarian grounds to find the missing jetliner. It is tedious and painstaking effort under the hot tropical sun. While some have pointed accusing fingers at certain parties, in particular those on anonymous social media, this is not the time to act like angry football spectators screaming at incompetent referees or players. Easy to scream from the sidelines, harder to don the soccer boots and play. Perhaps a better response is to support and pray for all those involved in the search and rescue, that they might have Godly wisdom, enabling, perseverance and strength to do their jobs as best they can, to locate the missing jet and her passengers as soon as possible. Visiting season 2014 kicks off for many Redang resorts today. This year will also mark the 16th year of this website's existence. That's almost jurassic age in the technology time-scale. The world has changed a lot in that time. Back when we started, web designers were preoccupied with how to make their web pages load quickly over a 56K dial-up modem connection, and 'google' wasn't a verb. Today, its all about responsive web design and rich media interaction. No wonder this website is showing its age (and mine too). In Asia alone, 30 percent of web traffic is driven from mobile devices with fast wifi, 3G and 4G LTE connections. So what does all this mean? Two things. Firstly, it's time for a new responsive website coming your way... soon. Now you know why I've not updated this site very much. Yes, I've been lazy, Yes, I haven't been to Redang for almost 3 years. Yes, I've been distracted. All valid reasons. But also because I've been working, or trying to. Progress has been slow as my old tired brains can't keep up with the latest web technologies. For someone who has experienced punch-cards, cassette tape storage, 5-and-a-quarter inch floppy disks, microcomputers with just 16K RAM (Sinclair Spectrum, BBC Micro, Commodore 64 anyone? ), I'm like an 8-bit brain stuck in a 64-bit world, processing 56 kilobits of information per second when they are flying at me at hundreds of megabits per second. Secondly, with information on anything available anytime, anywhere (thanks Google! ), this website has outlived its purpose. We provided online information at a time when there wasn't much information easily available and tried to promote responsible tourism to protect the marine environment. Today, every major resort in Redang has its own website. Some have even embraced social media like Facebook to better connect with their customers. There are many travel websites with information about Redang. There's also a lot of plagiarism, so even if this site closed down, you'd probably still find parts of it existing on many other sites. Times change. We are now in a different season of this website's life (and mine). It's time to take the site in a different direction. What that is, you'll just have to wait and see. The good news is that starting 22 April 2014, Air Asia will begin direct flights between Singapore and	Kuala Terengganu. The current plan is to fly 3 times weekly on Tuesdays, Thursdays and Saturdays. The best part is the flights leave Singapore at 9:10am and arrive KT at 10:35am, making it possible to catch the noon ferries to Redang. Flights leave KT at 11:35am and arrive Singapore at 1pm which will give	visitors catching the morning ferries out of Redang ample time to get to KT airport. Finally we have an affordable and convenient way to get to Redang by air. Let's hope this service lasts longer than Firefly's extinct Singapore-KT service. Of course, for the ultimate traveller, nothing beats Berjaya Air for its direct flights between Singapore and Redang island. But ultimate convenience comes at a cool price of about SGD350 return. Many resorts are now having their opening season early-bird promotions for travel in March. Those interested should check out each resort's website to take advantage of their special offer packages. And as usual for those planning to visit Redang between April to September, best to book early especially during long weekends and holidays as it can get crowded during these times. Since their name change from Amannagappa Resort back to Wisana Redang resort last year, Wisana can be contacted through its own website as well as through its Facebook page. The islands of Pulau Aur and Dayang in Johor state have been popular destinations for divers, especially those from southern Malaysia and Singapore. I did my open water certification in Pemanggil and my advanced certification in Dayang/Aur. Though I've never returned since, it's now even more unlikely I will return anytime soon, not with the RM200 per day scuba diving fee imposed by the state government for diving at any of the six islands in the Sultan Iskandar Marine Park (formerly known as Mersing Marine National Park). Only 100 divers are allowed on any island at any one time. 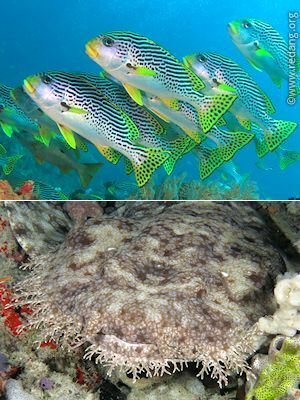 While it is a laudable move to help conserve the marine environment, it's laughable to charge even higher than the dive fees at world class sites like Sipadan or Raja Ampat.